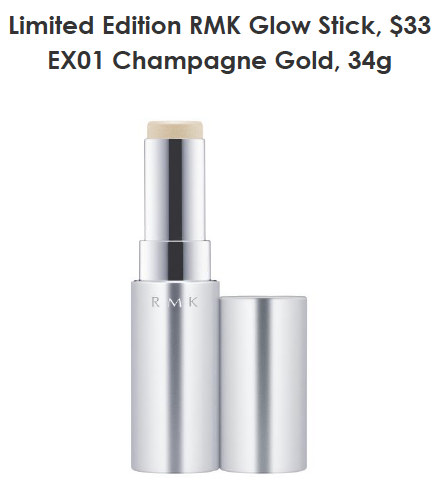 makeup & beauty blog by Andy Lee Singapore: RMK’s new Creamy Foundation N and limited edition Glow Stick! RMK’s new Creamy Foundation N and limited edition Glow Stick! Consists of clever light-diffusing powders to even out imperfections without build-up. Packed with a blend of botanical oils and extracts including Argan Oil to provide an extra dose of hydration. Infused with highly skin-loving Rice Brand Extract to hydrate and soften the skin while drawing out bouncy elasticity from within. Contains "Stretch Film" - a thin diaphanous layer with long-lasting elasticity which adheres tightly to the skin like a cellophane tape to form an elastic thin and even film, providing a long-lasting fresh and supple coverage even for those with fine lines. Feather light creamy texture that melt seamlessly onto skin with medium coverage to cover noticeable pores, dull patches and areas of uneven tone with a dewy finished. For dry, mature skin types and noticeable fine lines. Limited edition shade of stick highlighter that helps creates natural definition to facial contours. Add subtle pearls of light to accentuate your natural elegance for a luminous youthful look. Packed with Royal Jelly Extract that locks in moisture. Apply directly with the stick after foundation and spread onto your highlight areas, starting from the cheek bones. Can also applied over face powder. The body Shop Festive Season Collection!